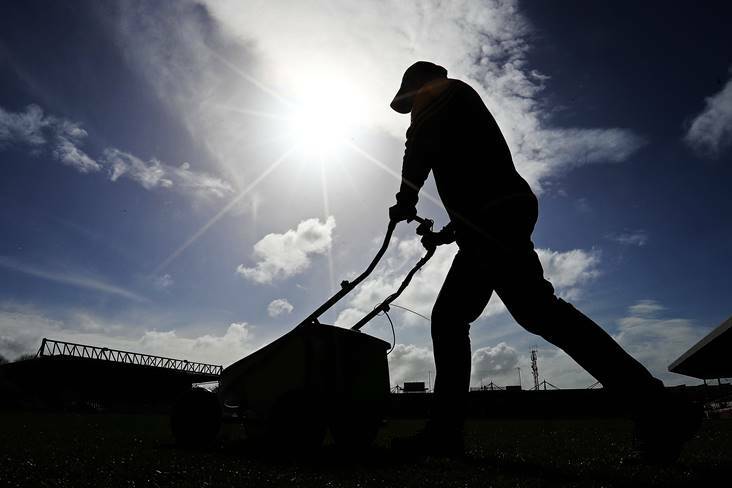 A groundsman lines the pitch before the Allianz HL clash between Kilkenny and Wexford at Nowlan Park. We've reached the knock-out stages of the Allianz Hurling League and here we preview the eight games taking place this Bank Holiday Sunday. These two met at the very same stage two years ago and it was Kilkenny that inflicted Offaly with a 6-20 to 0-14 hammering at Nowlan Park when all was said and done. The Cats are red hot favourites once again for this last eight meeting but they're coming up against a Faithful outfit in a better place than recent years under Kevin Martin's stewardship. Despite last weekend's late defeat to Antrim, Offaly finished third behind Limerick and Galway in Division 1B after picking up two wins against Dublin and Laois. Brian Cody's side have wing-back Joe Lyng ruled out for the remainder of the league but other than that the Leinster kingpins have a clean bill of health and should come through comfortably in Tullamore. This was the fixture that stood out once the quarter-final pairings were confirmed last weekend and hurling fanatics will be hoping for a classic when these two cross swords at Innovate Wexford Park. Galway couldn't halt Limerick's momentum last time out, which allowed the Shannonsiders to spring an upset in Salthill and earn themselves the right to hurl in Division 1A next season. Joe Canning was among the substitutes in the Tribesmen's 2-18 to 1-19 defeat and the Hurler of the Year should see more game time when the west siders visit the Model men in a repeat of last year's Leinster final. Davy Fitzgerald's charges went down to Kilkenny by three points in Round 5 and will be keen to bounce back when they welcome the All-Ireland champions, so this one has all the right ingredients. The formbook only points to one result in this one as Tipperary head for Parnell Park on Sunday as 1/14 favourites. When these two met in the qualifiers last summer the Premier men struck 6-26 past Dublin's defence in Thurles but at least the capital men won't have to contend with Seamus Callanan on this occasion. Instead Pat Gilroy's side will need to figure the best way keep the likes of Jason Forde and John McGrath doing them irreversible damage this weekend. Ronan Hayes's 2-4 contribution against Laois saw the Dubs pick up two vital points last weekend and the general feeling is that Tipp will bring the curtain down on a very mixed league campaign for Gilroy's men. Everyone loves a good derby and this one has all the makings of a great one as John Kiely's newly promoted Limerick side welcome Clare on Sunday. The Treaty men rode their momentum all the way in Salthill last weekend to topple Galway for a top-placed finish in Division 1B, with Aaron Gillane and Seamus Flanagan to the fore while fellow All- Ireland U21 winner Kyle Hayes also came off the bench to grab a crucial goal in the upset. They'll welcome the Banner men with plenty of confidence, knowing that a better start will be required against the visitors whom started their Division 1A campaign in such a positive fashion before losing their last two games to Wexford and Waterford. Last year's Munster semi-final meeting between these two saw Clare emerge from Thurles as four- point winners and don't be surprised if the margin between these two is narrower this time round. Waterford's win over Clare last weekend couldn't see them avoid this relegation play-off against Cork as both sides get set to go hell for leather at Pairc Ui Rinn on Sunday. This will be the second meeting between the sides in three weeks, with the Deise men having scored a 1-20 to 1-15 victory in Round 4 and the Rebels will be going all out to ensure that their opponents don't repeat the trick this weekend. However, the formbook suggests different as John Meyler's team have lost their last four outings since defeating Kilkenny on opening weekend. The bookies make it a close one to call and, in the end, it could well come down to a shoot-out between opposing marksmen Patrick Horgan and Patrick Curran to see which county will continue hurling in the top division next season. When these two met last month it was Laois that recorded a five-point win at O'Moore Park, having trailed by as many points at the half. O'Moore boss Eamonn Kelly has described this Sunday's relegation play-off in Dunloy as a '50/50' contest and he's not far off the mark. The Saffrons finished strong to upset Offaly in Round 5 and will take plenty of encouragement from that and the fact that they'd a spread of 12 different scorers against the Faithful men. Westmeath won all five of their games on Division 2A, including their meeting with Carlow in late January which saw the teams level at half-time before the Lake men kicked on for a five-point win. Allan Devine has been leading in the scoring stakes for Michael Ryan's men and their Leinster counterparts will need to ensure he isn't afforded cheap frees at O'Moore Park on Sunday. The Barrowsiders are looking to avoid their third final defeat in-a- row in this division, having lost out to Antrim last year and Sunday's opposition in 2016. Last weekend's final round meeting between these two saw Down score a massive 3-19 to 0-14 victory in Portaferry to ensure their place in the final. This Sunday is set to be a different kind of affair however, as Mayo get set to welcome back a couple of regulars into their team which should make for an interesting re-match when the sides collide again in Cavan town. Be sure to follow our Match Tracker for full LIVE text commentary on all the Allianz Hurling League knockout action as it happens on Sunday.